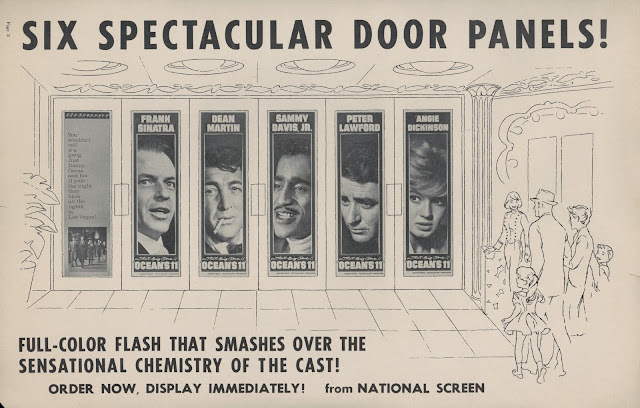 I want to go back to 1960 and shake Frank Sinatra for not applying himself more to Ocean's 11. Same goes for Rat associates, save perhaps Peter Lawford, who spent five years bringing O11 to fruition and made honest effort toward better outcome than what $3.1 million finally bought. Most was Warners' negative cost, dollars they knew would come back, and did, to swinging tune of $8.1 million, participants calling that a fine day's work and the heck with posterity's verdict. Did a goldbricking Pack really think so little of movies as to fritter away promise of this one? Dean tried on The Young Lions as Frank had with Golden Arm, and both applied selves to Some Came Running. Had they lost respect on this occasion for playing something close to lives they actually led? 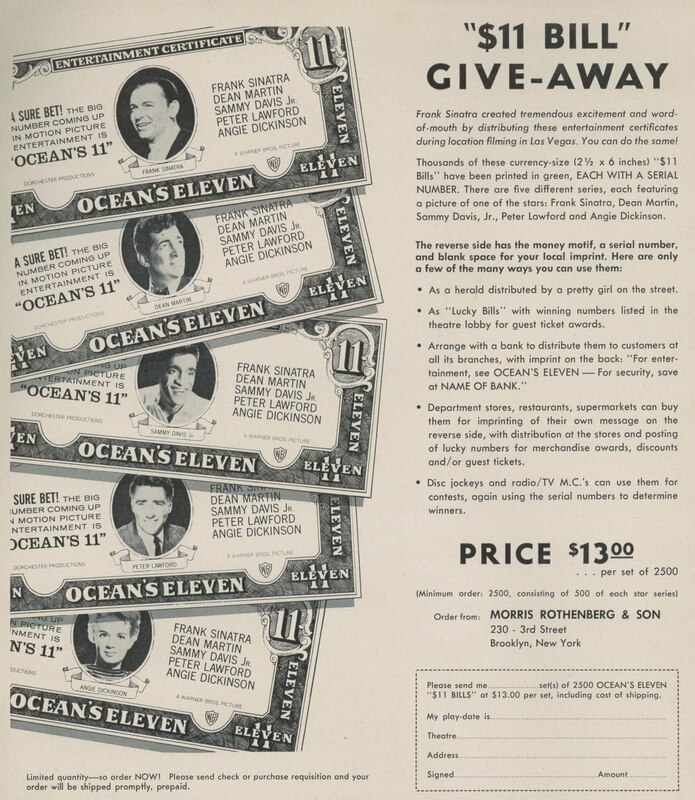 Ocean's 11 could have been a crackerjack thriller with song and novel background like movies seldom saw. Real commitment first time out might have been impetus for a Rat Pack series we'd respect more than spoiling cheese O11 and successors amounted to. But where's use of crying for lost opportunity fifty years out? 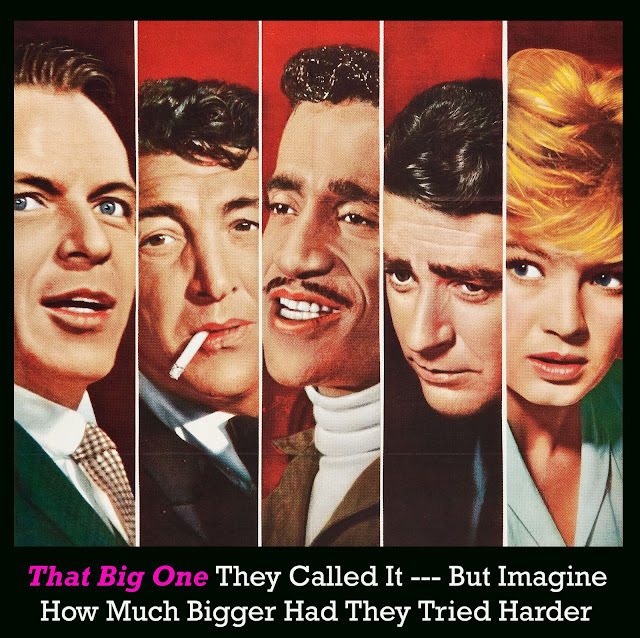 Irony's jest is a remade Ocean's 11 for 2001 breeding (so far) two sequels, proof of standards since '60 lower even than Sinatra and Company's when they sluffed through the original. My family drove by Vegas on a motor trip west in 1962. I remember glittering signs outside, less the casinos within where my first game of chance was played upon a slot machine near the entrance. Pity I couldn't appreciate Sin City at its summit for being aged eight, but I do recall wondering why indoors kind of shrunk from massive neon canopies without. Surely a movie about all that would be fun, though. 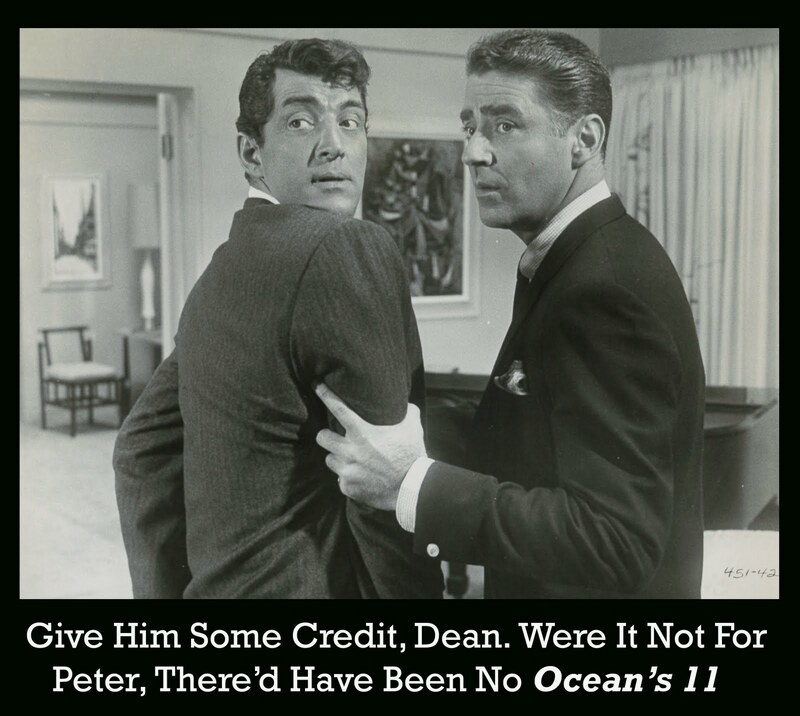 Peter Lawford thought so on receipt of a heist yarn he'd bought five years ahead of Ocean's 11. Modest prospects saw it farmed to TV director Gilbert Kay for a 1956 follow-up to his feature bow, Three Bad Sisters, indie Matador Productions going forward with this actioner not unlike then-recent Five Against The House. Somehow that fizzled and Ocean's 11 came across Sinatra's bar counter, his interest, of course, making it a go. Lawford would stay on as co-star and now junior producer, their company called Dorchester. Casting announcements began flying, seemingly all of Hollywood wanting in on Frank's party. Dean Martin was set, then temporarily out for scheduling conflicts, Jack Lemmon slated to replace him in December 1958. 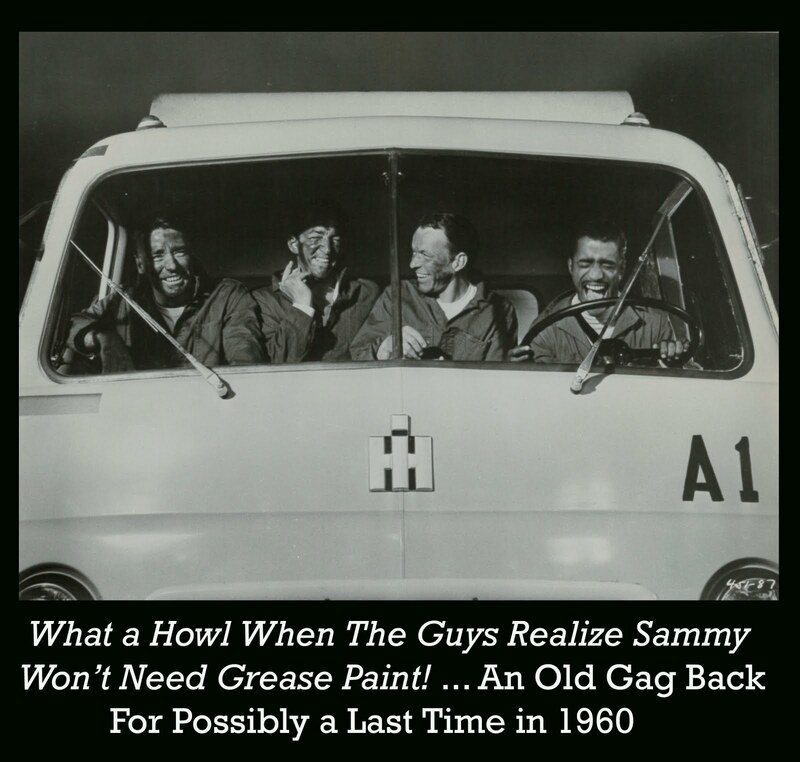 By March of '59, they wanted Sugar Ray Robinson for what ultimately was the Sammy Davis part. 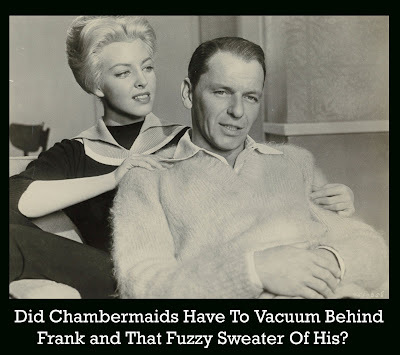 Sinatra and Lawford sought Robert Wagner as well, but Fox wouldn't loan him. Neither could Steve McQueen get a leave from Wanted --- Dead Or Alive, the latter announced along with Tony Curtis as late as October 1959. Frank wanted cast-mates he'd worked with, thus an invite to A Hole In The Head's Edward G. Robinson, who proved unavailable. By time casting firmed up in January 1960 (as late as 1/8, Robert Culp was being floated for a "key role"), the caravan was set to winter in at Vegas for casino locations. 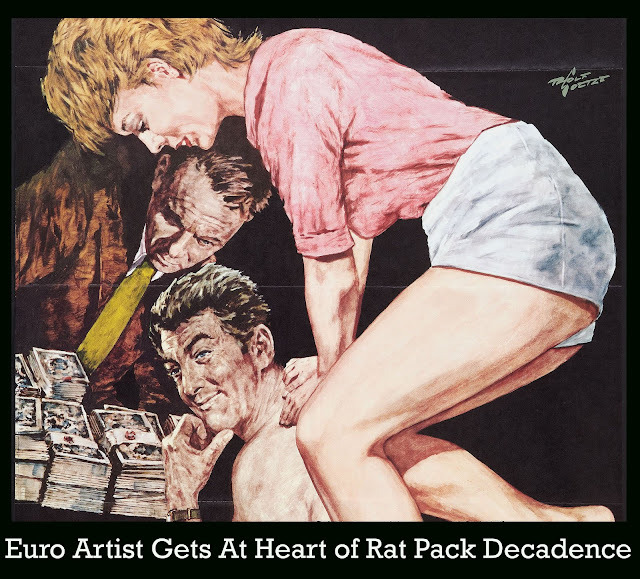 Writers addressing the Rat Pack sometimes get a little ring-a-ding dingy themselves, so I'll try avoiding hep talk and propagating tired myths. 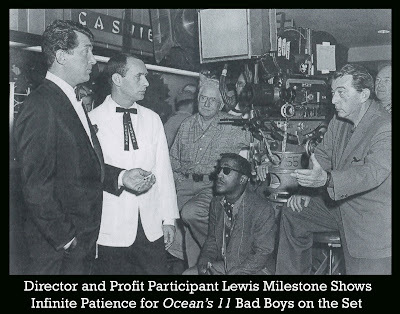 One posits Lewis Milestone as a broken-down director thrown an O11 bone for submission to Frank's authority and willingness to take crumbs Dorchester/Warners handed him. What I found was Milestone in for a percentage of Ocean's 11 along with FS, Lawford, and Dino. They named him producer as well. Someone has to be around the store all the time, said the veteran helmsman, and so long as chips were partly his, why not Milestone? Lawford was confident enough in the project to take all of his compensation on the backend. Ocean's 11 filmed mostly on days after all-nighters the cast pulled. Drinking, performing, then steam bathing it off for fitful hours' work did not make for focused performing. 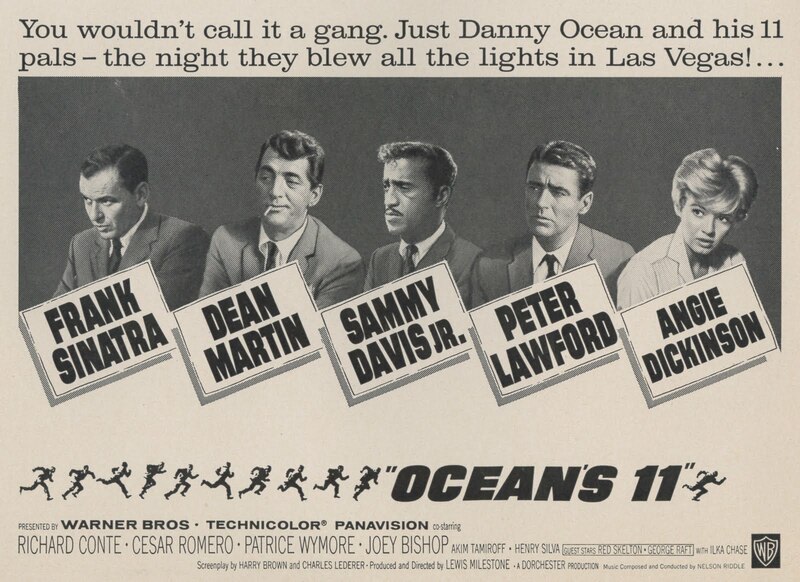 A finished Ocean's 11 would reflect many calls Sinatra missed. How else to account for so much of tiresome Akim Tamiroff and somnolent Joey Bishop? Also livening Vegas those months was Columbia's Pepe company. Headquartering as well at the Sand's Hotel, they were separable from O11's crew only by different colored baseball caps issued respectively. On-camera overlap saw Dean Martin and Sammy Davis in Pepe cameos shot concurrently with work on Ocean's 11. Vegas and the Pack were riding crests that winter. Jack Kennedy checked in to see the boys perform and consolidate show biz support for his presidential bid. What was happening live naturally seemed more important than nonsense recorded on film. 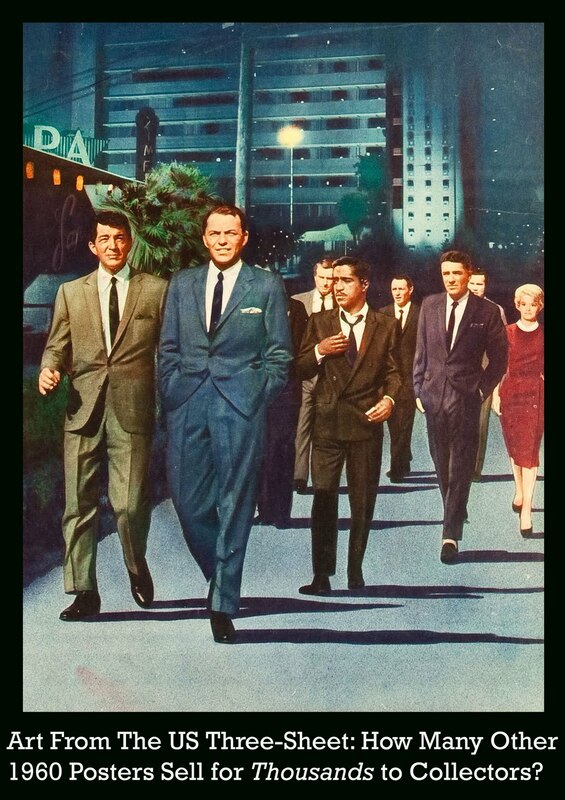 To think that for awhile, Sinatra intended to direct Ocean's 11. He did at least want it to look good, insisting that Warners shoot in Panavision, the company's first using that wide format. Lewis Milestone put a good face on Vegas when he told Army Archerd they'd overshot the location's budget by a mere $1,000. Latter-day viewers are surprised by modesty of O11 casino and hotel settings, figuring upon temples not unlike what's built over ruins of a Vegas strip gone decades now. Fact of matter is these were humble, at least by comparison, being stopovers for 50/60's travelers who didn't expect grandiosity we're conditioned for. 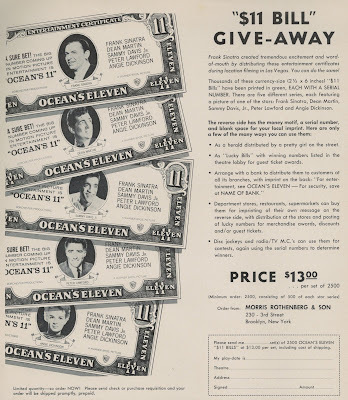 Ocean's 11 is in part a sad revisit to ways of debauched life passed and an entertaining Olympus whose deities filled lounges nightly --- just a look at marquees in the film makes you realize anew those days ain't never coming back. The 60s TV series "Wild Wild West" had a very odd episode featuring Davis as a sort of psychic avenging an old murder, and Lawford as a repentant member of the gang. 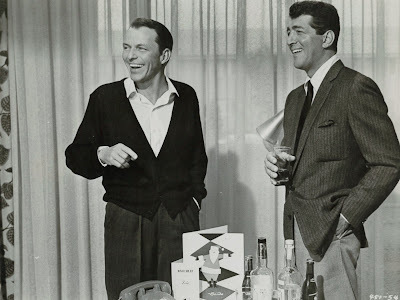 I had the definite sense it was written to star the whole Rat Pack, perhaps with Sinatra or Martin in the part Lawford got. As it was, you had a surplus of unnecessary villains played by comparative unknowns. Actually, I enjoyed OCEAN'S 11, 12 and 13. Have you seen them? I think McQueen initially wanted to do O11, but, if memory serves, Hedda Hopper (of all people!) advised him against it. She said that if he struck out on his own, he'd be a star, and, doing a sintra picture, would he's simply become another Sinatra hanger-on. Who knows? I'm just glad we got at least three seasons of Wanted: Dead or Alive! Jack Lemmon in Ocean's 11? Yech! I'm so glad you give Lawford some credit for something...anything. Too many people dismiss the guy. He does have that sad,"please accept me" thing going on, which might be why people are repulsed. I like Lawford the performer. Indeed, I enjoy all of these guys...separately. When they get together it's usually boy's night out, and I'd rather not pay to see them live it up, swagger around, paw women and drink themselves silly, thank you. Interesting review. Thanks for the details. Bob, from what I read, McQueen really wanted to do "Ocean's 11" and would have had he been able to get time off from the TV series. Donald, I remember well the WWW episode with Davis and Lawford. Those two must have been good friends for all the occasions they worked together. Java Bean, I do think Lawford deserves a lot of credit for O11 and efforts to make it a good film. There'll be more about his participation in Part Two. What fun! I wouldn't have wanted to be a part of this group - what egos and all that cigarette smoke - but am so glad they worked together. Thanks a lot for this, Mido. We can only wish Welles HAD directed "Ocean's 11." What a great show that would have been.